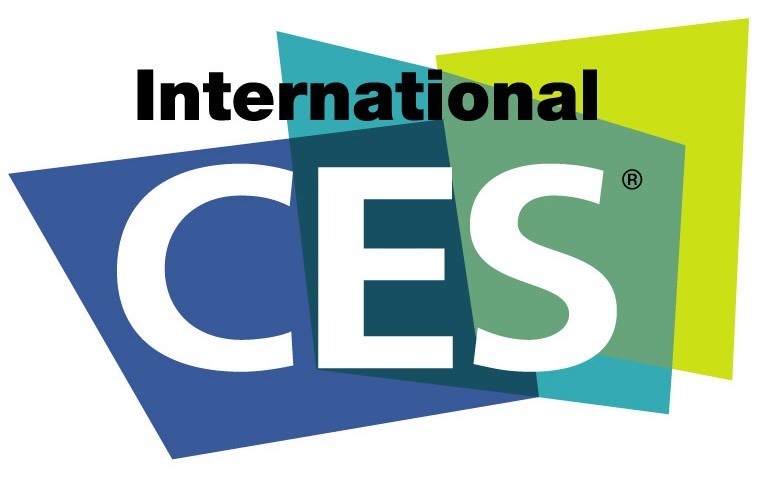 With 160,000 attendees, CES is the largest consumer technology show of the year. It’s not just consumer electronics though. CES has become an important automotive event too. More than 10,000 representatives from the automotive industry attended last year. We will be exhibiting in the South Hall 2 at booth 26510. Planning to be there too? Come see our latest computer vision and video coding technologies. Let’s meet and discuss how we bring unique value to your SOCs. In October, we announced our partnership with VISCODA and demonstrated their automotive vision algorithms running on our silicon platform. 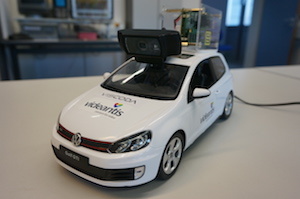 VISCODA’s Structure from Motion algorithm extracts depth information from a single standard camera, enabling cars to better understand their environments. VISCODA has a strong history in algorithm and software development for digital image processing, computer vision, and 3D scene analysis. One unique feature of the combined solution is that the demanding ADAS algorithms don’t run on a high-end multicore CPU/GPU combination in the dashboard. Instead, the algorithms run on a very small, low-power videantis processor integrated inside the camera. In October, the IEEE-SA Ethernet & IP @ Automotive Technology Day conference took place. 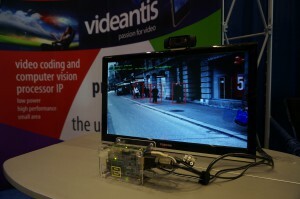 We showed our video coding and computer vision ADAS solutions that are optimized for Ethernet AVB. Attendance seemed down a bit compared to last year’s conference in Germany, but that doesn’t mean Ethernet technology adoption is slowing down. On the contrary, it’s clear Ethernet will become the standard technology for high-bandwidth in-vehicle networking. 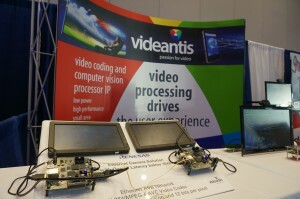 Videantis showed a variety of video coding and computer vision applications, all running on the same multicore, low-power, high-performance v-MP4280HDX silicon. Integration of the videantis architecture into an Ethernet AVB camera has the advantage that video analytics algorithms can run on the raw, uncompressed images, before they’re encoded and transmitted. As a result, the ADAS algorithms don’t suffer from the artifacts introduced during compression and instead retain their accuracy. All in all, another very successful show, and we’re excited to continue working with our customers that we met there. We are looking forward to next year’s show. WebRTC is a key initiative that brings video conferencing straight to your browser. Firefox, Chrome and Internet Explorer are backing the standard. WebRTC had been deadlocked for years over whether to adopt VP8 or H.264, but now decided to make both codecs mandatory. Things may change however. If either codec becomes definitely royalty free then the other codec will be dropped. The videantis architecture supports both codecs by the way, so we’re ready for the new standard to take off. Audi’s self-driving RS 7 recently conquered the Hockenheimring racing circuit in Germany. The modified sedan finished each lap in just over two minutes, reaching speeds of over 137mph, and driving the optimal trajectory you’d expect a racer to take. The automated RS 7 is completely driverless and uses GPS and a 3D imaging camera to track its position down to 1 to 2 centimeters. Last month saw another fast-driving car announcement: Tesla’s Model D. CEO Musk said its new “auto pilot” function does not mean the car could drive itself though — as he put it, a driver cannot “safely fall asleep”. Instead, Tesla supports lane keeping, semi-automatic lane changing, and auto braking. While Tesla is a leader in electric vehicles, it picks up solutions that are available off the shelf for its ADAS features. Bosch is the supplier for long-range ultrasonics and radar, while the camera assembly chip is from Mobileye.